In recent years, technology has allowed air conditioners to become extremely efficient at cooling and dehumidifying the air inside your home. That allows your indoor air quality to remain at a high level so that everyone inside can be comfortable and breathe healthy air, but it also makes the best use of the power that it consumes in providing that healthy, conditioned air. So the new breed of an air conditioner can also lower your utility bills while it is doing a better job of providing a comfortable living environment for your family. The one quality that even this newest generation of air conditioners have all lacked though, was any sense of style or aesthetic appeal – that is until the arrival of Daikin Ductless Emura. Conventional thinking held that air conditioners had to be big and bulky, box-like in their appearance, and a noisy piece of equipment that had to be tolerated because of the benefits it provided to a household. 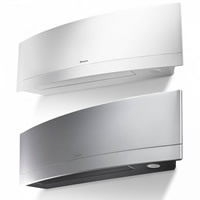 The Daikin Ductless Emura systems shatters that old school line of thought with its soft, curved profile and designer look, mounted high on any of your home’s walls, hardly even identifiable as an appliance. Because it’s part of a ductless system, there aren’t even any ducts necessary throughout your residence, so the overall system footprint is minimal, and the styling makes it seem like there’s no visible component of any cooling system. Available in either a silver color or pure matte white, Emura can be perfectly coordinated with your existing home decor to be an appealing part of your contemporary interior decoration scheme. By no means has technological efficiency been sacrificed for style and aesthetics however. 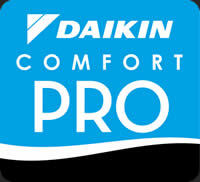 Underneath the great-looking exterior is built a highly intelligent system, which is very responsive to your needs and can be controlled by means of the Daikin Control App, even if you’re on vacation away from home. Its whisper-quiet operation has an 18.9 Seasonal Energy Efficiency Ratio (SEER), which means it gets the most cooling out of each unit of power it uses, thereby consuming significantly less electrical power over the course of the warm season. It’s photo-catalytic air purification filter allows it to trap up to 99% of all pollutants and debris which might otherwise be contaminating your household air supply, and degrading indoor air quality. 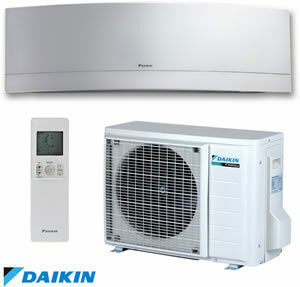 The manufacturer is so confident about the extended lifetime reliability of the system, that a limited 12-year warranty is provided with Daikin Ductless Emura on all parts. In short, this new breed of air conditioner operates at maximum efficiency, while making almost no noise, and being controlled remotely – but still looks so good that it seems to be just another part of room decor. To find out more about ductless air conditioning systems, and Daikin Emura specifically, contact us at Genesis Refrigeration & HVAC, LLC. We service a broad range of communities in western Washington state, including Snohomish, Sultan, Goldbar, Woodinville, Bothell, Everett, Woods Creek, Maltby, and Monroe. We’ll be happy to answer any questions you may have or to schedule an appointment to review your residence and discuss your home air conditioning needs.